The great mystery of politics -- and everyday life -- is that there are usually two ways of looking at any one set of facts. Consider the business career of Alan Bond: most Australians consider that his alleged misdeeds typify business practices of the 1980s and thereby cast a pall over the concept of deregulation, and indeed indict capitalism. I look at the same set of facts, accept most of the same criticisms of Bond's business practices, but conclude very differently. Deregulation could be expected to result in bad practices ... for a while. When a society changes from one equilibrium (a heavily regulated one) to a new one, there will be mistakes made. Australia forced business to let go of the Nanny State's apron strings, and what child does not stumble at some stage on first receiving adult freedoms? The same set of facts demonstrate to me the virtue of a free-market system. Those alleged misdeeds of Bond were punished. Yes, in part by the State, but much more ferociously by the market. Would Bond's initial business successes have been any less, or his failure any different, had there been no deregulation? Well, much of his success took place before the deregulation, while his failure may have been averted by the traditional calls upon the State to rescue him. David Friedman has probably never heard of Alan Bond since he is a US academic. 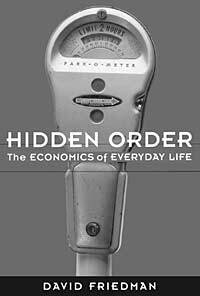 But his book, Hidden Order: The Economics of Everyday Life, constitutes a very different way of looking at nearly everything from that used by most people around us. It is an odd book, combining elements of an introductory economics text, a layman's guide to economics and a qualified advocacy of the economic view of things -- the 'things' being everyday life. All this is packaged with considerable wit, yet a fair degree of rigour. Divided into five sections, the structure takes the reader carefully from knowing nothing about the subject to analysing crime, politics and interpersonal relations using economic tools. The first section, 'Economics for Pleasure and Profit', introduces two vital concepts, and makes strong cases for them: that people are essentially rational in the choices they make and that what people actually want is best assessed by looking at what they do, rather than what they say (the principle of 'revealed preference'). It is rather as if the New York Times had carried editorials worrying about how the Apollo expedition was going to avoid crashing in the first of the crystalline spheres -- the one at the orbit of the moon. Ricardo gets an earlier mention as the inventor of a powerful tool in economic analysis: the simplification and stripping away of the unessentials from a problem to allow understanding. In some respects there is a void in the book, hinted at by the use of Ricardo. Friedman skips virtually all contributions to economics between Alfred Marshall and the public choice theorists of recent decades. Thus the name 'Keynes' and its derivatives are not mentioned even once throughout the book -- something that must make Hidden Order almost unique in economic literature. Section III takes the book to a new, high, level. It reinserts most of the complications (monopoly, oligopoly, transaction costs, time changes and luck) assumed away in the second section, and then proves that the general rules previously derived largely continue to apply. The fourth section -- 'Standing in for Moral Philosophy: The Economist as Judge' -- commences by disavowing any capability for the science of economics providing moral answers. But it then makes the case for economic efficiency being a useful stand-in for vague, and difficult to measure, notions of overall happiness. As throughout the rest of the book, terms are defined in down to earth and easily digestible terms, so we are not left wondering precisely what is meant by 'efficiency'. Such things as price controls reduce overall economic efficiency, and by proxy happiness. But he distinguishes between cases in an informative way, pointing out that price controls on petrol have a much more immediate effect, and therefore more immediate reduction on welfare, than rent controls. Indeed, he speculates that the greater public support for rent controls stems from the fact that its initial effect is all 'good': a transfer from landlords to tenants. The adverse effects take longer to appear. The arguments of this book are powerful, the lens through which the world is viewed is utterly different to that used by nearly everyone. And problems with theory are not skimmed over. At many points during the book I was thinking, 'Ah, but what if this complication is added' only to find on turning the page that Friedman had added it, and discussed its effect upon his conclusions. That legalizing polyandry would improve the average lot of women seems obvious, and may be false. The claim I made--which is the one that seems obviously false but is true, at least within the model I was using--is that legalizing polygyny would improve the average lot of women. Legalizing polyandry lets one woman marry multiple husbands. That bids up the price of husbands, which benefits men but might possibly harm women. Polygyny is the other way around. In any case, I enjoyed the review and am glad that you seem to have enjoyed the book.